This little fella lives in a street in Clearview, near a friend's house *waves at Ms C!*. He saunters along the pavement, pecking for food, or waddles along the side of the road, blithely ignoring cars, who have to go around him. My thought the first time we saw him was that he was lost and needed rescuing. But let me tell you, they are remarkably hard to catch, so I couldn't take him home! Having seen him 3 or 4 times now in the same street, it seems that he lives there as a free ranger. 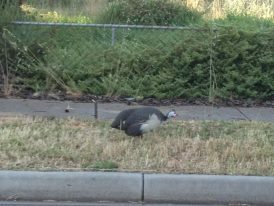 He (or more likely She) is a guineafowl, a species of ground-dwelling bird native to Africa. According to Wikipedia guineafowl have a long history of domestication, mainly involving the Helmeted Guineafowl. The young (called "keets") are very small at birth. The keets are kept in a brooder box inside the house until about six weeks of age, before being moved into a proper coop or enclosure. They eat lice, worms, ants, spiders, weedseeds, and ticks while on range, or they can also eat chicken layer crumbles (one kind of commercial bird feed) while housed in a coop. The cooked flesh of guineafowl resembles chicken in texture, with a flavour somewhere between chicken and turkey. There is also a band in Sydney called Guineafowl, and you can like them on Facebook here. There's a Margaret Street Duck here on Kangaroo Island, but an urban guinea fowl is cool!